If America is an insane asylum, as Ezra Pound once quipped, it looks like the inmates are in full revolt. 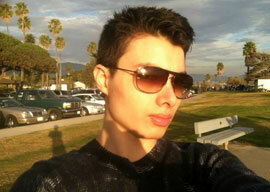 Just a few days ago, spurned scion of privilege Elliot Rodger went on a shooting rampage in Santa Barbara, California, in which he shot eight people and hit four with his BMW before either he or the fuzz blew his head off. This is on top of three people he had already stabbed to death in his apartment. Another marginal brat goes postal? Nothing to see here, move along. That is, unless you”re one of the countless dolts who want to use his spree to further their idiotic world views. Feminists have seized on Rodger’s prolific postings at the anti-manosphere forum PUA Hate“and the accolades his murders got from the site’s readership”as proof that MRAs (men’s rights activists) and PUAs are all budding Ted Bundys. The logic behind this process is presumably the same that leads leftists to blame JFK’s assassination on the South’s “culture of hate,” despite Lee Harvey Oswald being a card-carrying communist. The SPLC has even chimed in with yet another attempt to frighten their elderly donor base, pointing out the “racist” messages the half-Chinese Rodger posted on PUA Hate. It’s funny how the left, for all their bleating about how the manosphere encourages “misogyny” and violence against women, has only just now deigned to notice PUA Hate. Two years ago, in one of their quarterly Intelligence Reports, the SPLC went on a rampage against the manosphere, naming my old site In Mala Fide as well as my friend Roosh’s blog as “hate groups.” PUA Hate was conspicuously absent from their reports, despite the fact that they actually engage in criminal activity. Imagine 4chan’s /b/ devoid of humor or self-awareness and you have PUA Hate in a nutshell. The forum’s posters have repeatedly attempted to “dox” (expose the real identities of) prominent anti-feminist and seduction writers, have bragged about hacking Roosh’s forum in order to divulge his location to violent neo-Nazis, and have even stalked the girlfriends of PUA bloggers. Yet anti-anti-feminist writers such as David Futrelle don”t spend a tenth of the energy denouncing them as they do people like myself. Could it be that feminists ignored PUA Hate out of a fatuous “the enemy of my enemy is my friend” logic? If so, their negligence just cost at least six people their lives. But as Taki’s editor Ann Sterzinger re-Tweeted from I.Q. Elderbuttage recently, spree shootings make everybody into a moron. Whenever some deranged maniac decides to go ventilate some skulls, every halfwit wonk rushes to jam the killer’s square peg into the round hole of ideology. The left repeats their puerile demands for gun control, the right responds with boring NRA talking points. Feminists blame Rodger’s murders on “toxic masculinity” and “patriarchy,” even as anyone with a brain can see that America has demonized men and masculinity for decades. In true “Hogging Up the Holocaust” fashion, they ignore the fact that not only were the majority of Rodger’s victims men, he explicitly stated in his farewell video that he hated not only women, but men who were getting laid more than he was (which, since he was a virgin, meant virtually every man). Could it be that they”re all wrong? That this so-called “MRA Murderer” was just a garden-variety psychopath who used incel ideology as an excuse to kill?